This month’s White Rabbit Bloghop challenge, calls for ancient and modern in the same picture. The two Moscow landmarks featured below, are ancient and modern in the same building. Resurrection Gate (Воскресенские ворота), or Iberian Gate, connects the north-western end of Red Square with Manege Square and adjoins the ornate building of the Moscow City Hall to the east and the State Historical Museum to the west. Initially erected in 1535, the structure was rebuilt in 1680, with the double passage being topped by two-storey chambers crowned by two octagonal roofs similar to the Kremlin towers. What you see above, though, was built in the mid-1990s, a modern copy of the ancient original, which was destroyed in 1931 to make it easier for huge military vehicles to enter Red Square for parades. Kazan Cathedral (Казанский собор), also known as the “Cathedral of Our Lady of Kazan”, is a fairytale-like Russian Orthodox church located on the northeast corner of Red Square. The origins of this Cathedral date back to 1612 when Prince Dmitry Pozharsky funded the building of a wooden church here to thank the Virgin of Kazan for his recent military successes. It was destroyed by fire in 1632 but Tsar Michael I, ordered it replaced with a brick church, a one-domed building, featuring several tiers of kokoshniki, a wide gallery, and a tented belfry. By the end of the 17th century, the church building was expanded and received a bell tower and a redesigned entrance with numerous other renovations being undertaken during the imperial period. The Russian restorer Peter Baranovsky supervised a complete reconstruction of the church’s exterior to its original design in 1929–1932. Despite that, in 1936, Joseph Stalin ordered the square cleared of churches, in part to make way for his grand military parades. Although efforts were made by Baranovsky to save it, he could not prevent the Kazan Cathedral from being demolished (though Baranovsky did manage to save Saint Basil’s Cathedral, from destruction). After the fall of the Soviet Union, the Kazan Cathedral was the first church to be completely rebuilt. 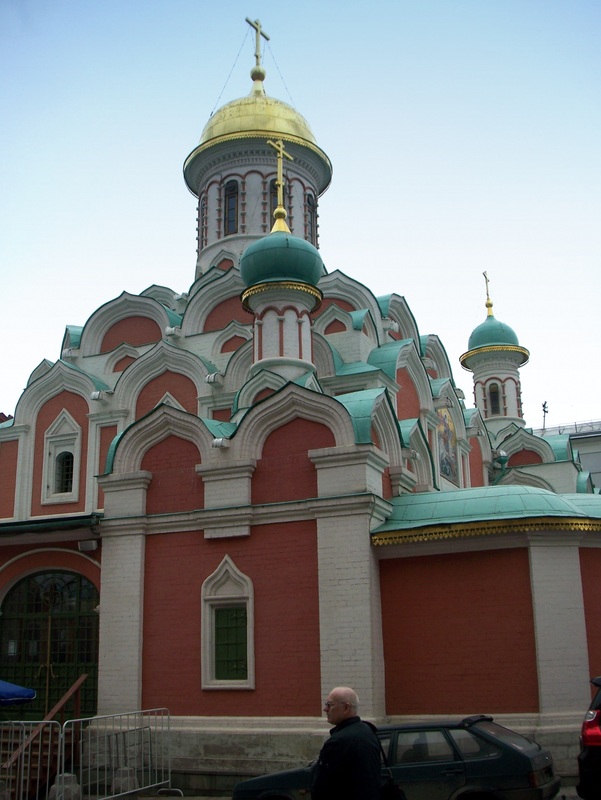 The cathedral’s restoration (1990–1993) was sponsored by the Moscow city branch of the All-Russian Society for Historic Preservation and Cultural Organization, and was based on the detailed measurements and photographs of the original church. These two buildings were just two of the massive differences I saw in Moscow when I returned in 2012, after my previous visit in 1979. Click here to read more. Aleksandr Senin at WISIWIS (What I See Is What I Shoot) for his beautiful photos of the life and sights of Moscow. His evocative pictures always make me want to return. CurioCity, a relatively new blog that I have only recently discovered, that guides its reader around less well known parts and activities in Moscow. I now have to return to discover some of these things – especially the Master and Margarita statue. i know nothing about moscow so your post is very interesting, thank you! It’s shots like these that make me want to visit Russia. Nothing else! It”s fascinating to see your photos, Debbie – as I’ve yet to visit Russia. Amazing! Thanks for the links to two blogs you enjoy visiting – I’ll HOP over there, right away.